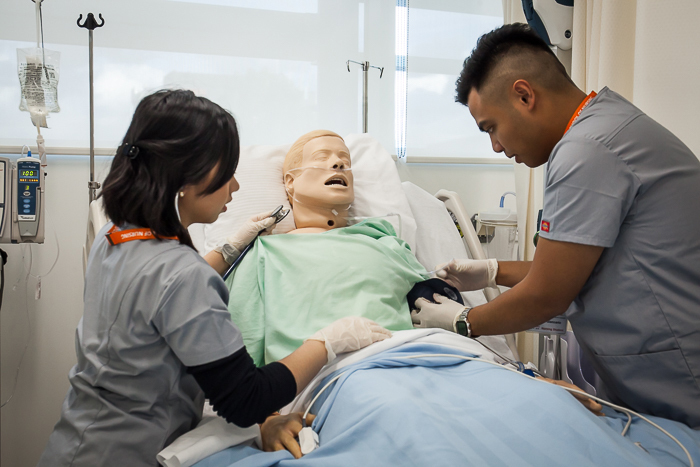 The members of the Faculty of Nursing at Langara College aspire to be professional exemplars in teaching, practice, and scholarship with a focus on excellence, integrity, evidence, collaboration, and a commitment to advancing a greater understanding of people’s experiences of health, illness, healing, and health promotion. The philosophical foundations of phenomenology, feminism, critical social theory, post-colonialism, empiricism and humanism form the basis of the curriculum. The meta-concepts of health promotion and caring are influenced and informed by these philosophical foundations. The Faculty of Nursing has received a seven-year recognition from the British Columbia College of Nursing Professionals. This is the longest recognition awarded by the provincial regulatory body. Faculty and students engage in a variety of academic activities including presenting papers and posters at local, provincial, and national conferences. Upon entry into the Faculty of Nursing, all nursing students will receive a copy of the Faculty of Nursing Student Handbook. The Handbook is used throughout all Faculty of Nursing programs and describes policies and procedures related to attendance, conduct, professional image, expectations, evaluation guidelines, grading, progression, and withdrawal from, as well as re-entry into programs. Many of these topics will be discussed during class or in seminar groups. It is the student's ultimate responsibility to be aware of these guidelines. Particular attention needs to be given to progression requirements. Each nursing student is responsible for maintaining a 2.33 cumulative GPA, with no grade lower than 65%, for promotion within any Faculty of Nursing program. To help celebrate 2018 Nurses Week, we asked people to take a moment to thank a nurse that has had an impact on your life. Read the heartfelt messages.